I've had a couple of prior posts on Google Plus Photos here and here. 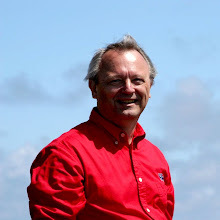 Overall not much has changed since my last post but I've made more progress in how to use Google Plus Photos. When I'm taking photos I tend to take both stills and videos. As I noted in this post videos up to 15 minutes don't count against your Google space quota (nominally 15GB). But Google Plus Photos doesn't have the editor functions of YouTube which are pretty nice. Without that all you can do is put the unedited videos into Google Plus Photos. So my idea was to use YouTube to edit the video and then download it and upload it to Google Plus Photos. But YouTube doesn't have a download function. I have played with web sites such as keepvid.com but they required Java in the browser which I avoid. Recently I came across ClipConverter. This is entirely web-based and fast. After you've used the YouTube editor publish the video and then go to ClipConverter. 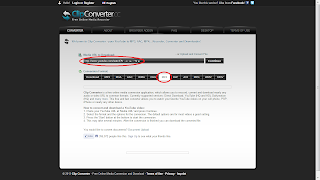 Enter the URL of the YouTube video and chose what output format you want. Click on "Continue" and select what resolution you want. Why not HD? You can specify the output file name here and change the output format. You can even specify the timecode of the start and finish. Then click on "Start." Quickly you'll get a screen with a "Download" link. Download it to your PC. Then upload it as normal to Google Plus Photos. Even better, in the Google Plus Photos album view you see an animated gif of snapshots from the video rather than just a still frame like YouTube. I've been getting inquiries about my post on Google Docs Gadget. I think I've made some progress. First you have to add the Lab "Add any gadget by URL". 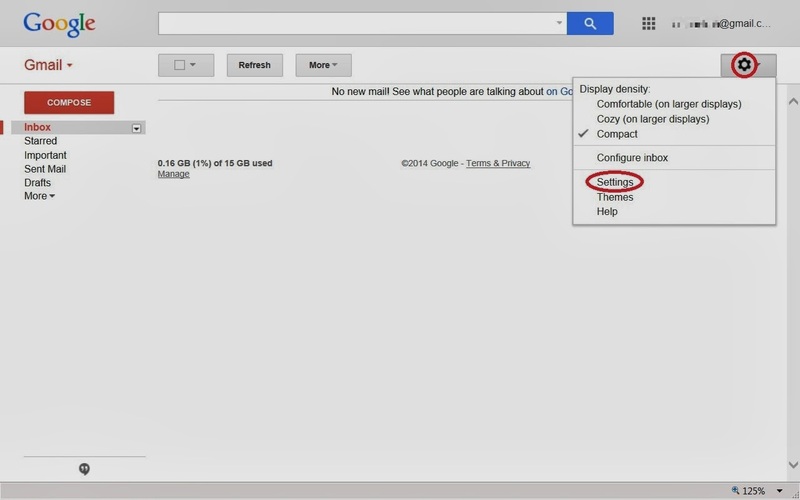 In your Gmail, click on the gear at the top right and choose "Settings". In the blue list at the top of the page should be "Labs". Click on that and find "Add any gadget by URL". 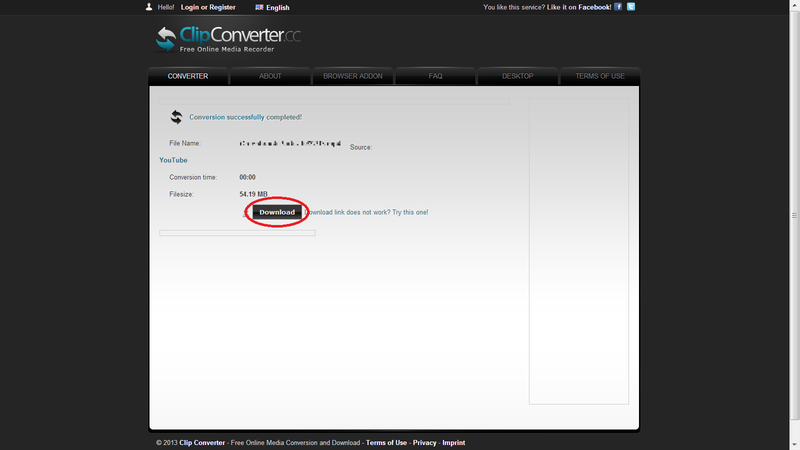 Check "Enable" and then click on "Save Changes" at the top or bottom. The next question is how to create the XML file. 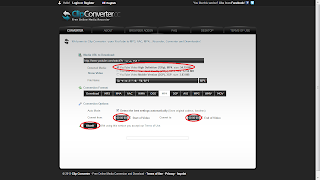 Copy all the text below by clicking anywhere in the box and pressing CTRL and A. Then press CTRL and C. Start Windows Notepad. Press CTRL and V. Now press ALT and F4 and click on "Save". 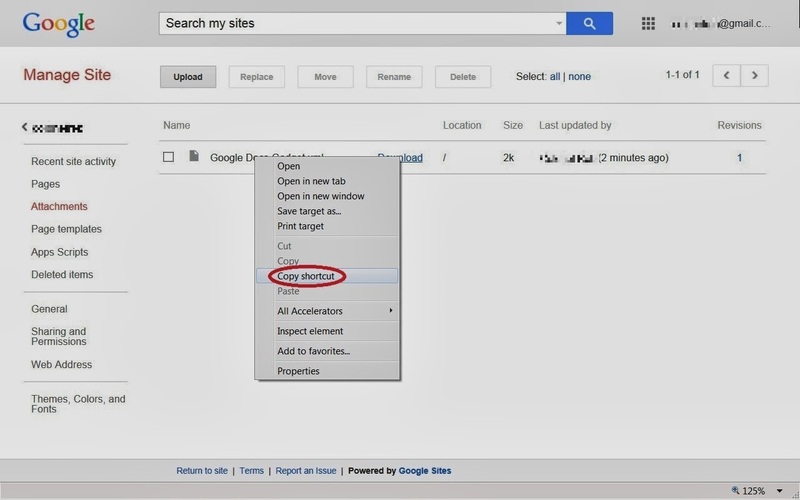 Navigate to the desktop and save as "Google Docs Gadget.xml". The last question is where to put this file so you can reference it as a gadget. 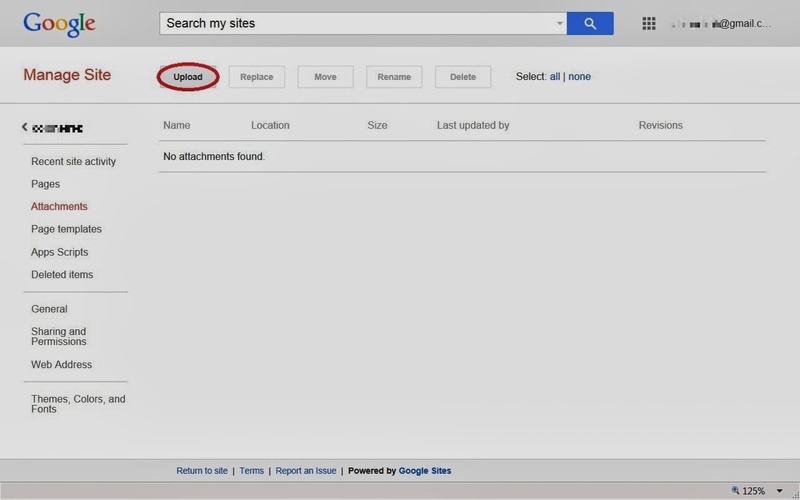 Login to your Gmail. 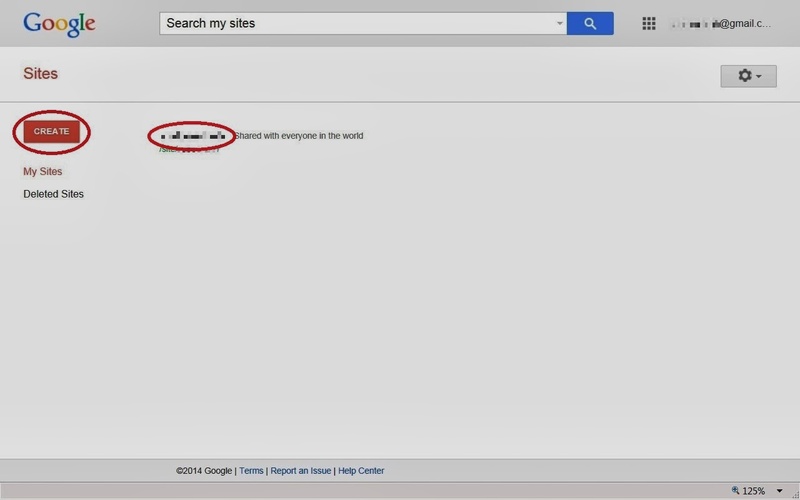 Open a new tab and go to "sites.google.com". There may be a name to the immediate right of the red box "CREATE". If so click on that name. If not, click on "CREATE", leave "Blank template" selected, enter a name for the site, enter the captcha, and click on "CREATE" at the top. 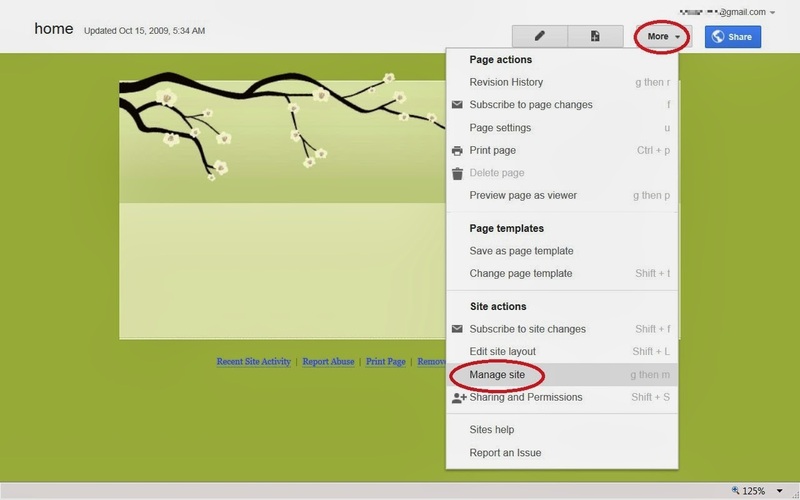 Now click on the "More" button at the top right and choose "Manage site". 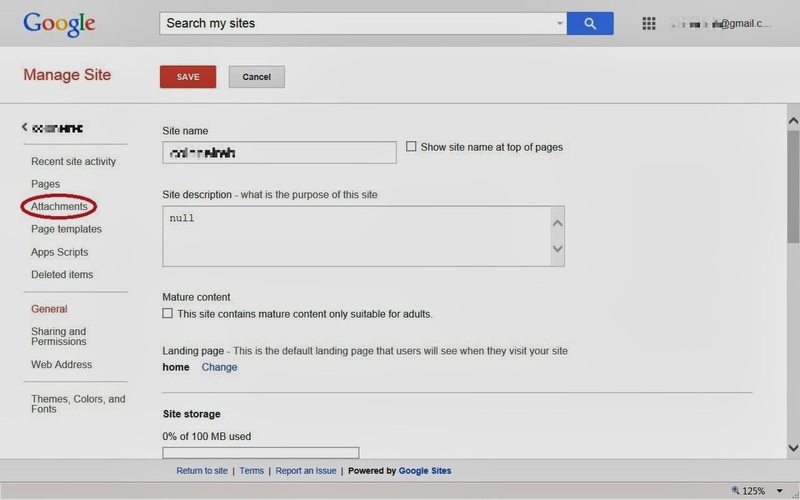 In the left column click on "Attachments". Click on "Upload" at the top left and upload the file you created above. 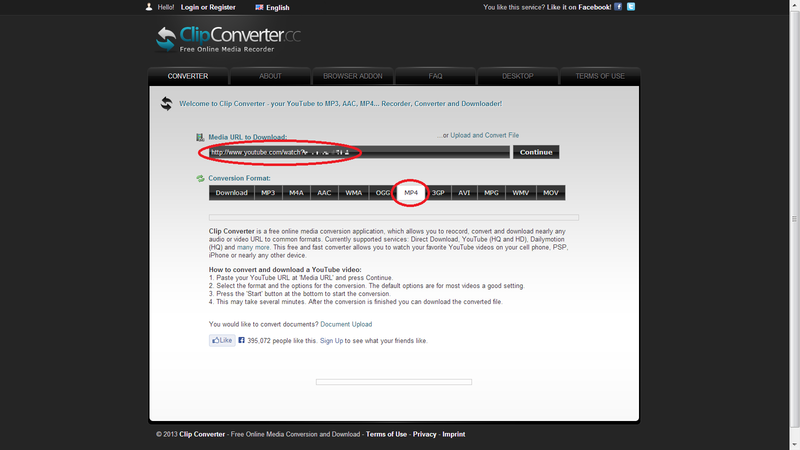 When the upload is complete, right click on "Download" to the right of the file name and copy the URL. 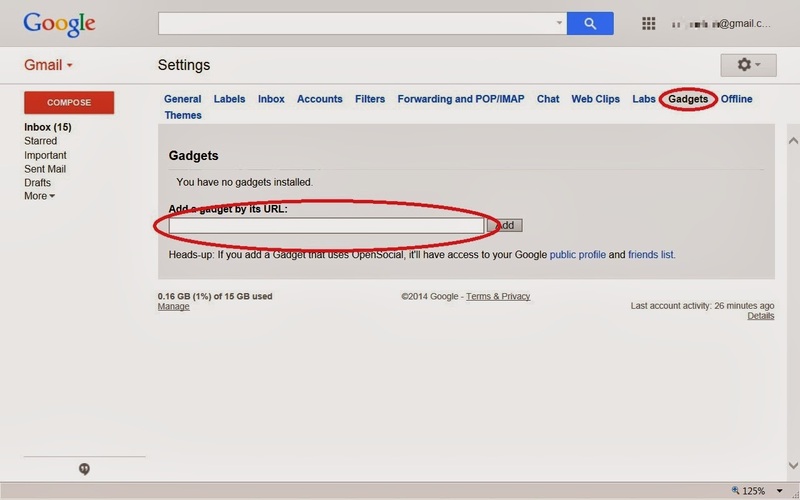 Go back to your e-mail and click on the gear at the top right and choose "Settings". In the blue list at the top of the page should be "Gadgets". 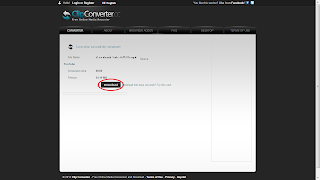 Click on that and paste the copied URL into "Add a gadget by its URL". WAIT. Erase the end of the URL back to ".xml". Now click "Add". Surprised? You shouldn't be if you've been following my blog. I've been using Tivoli Continuous Data Protection for years. I've been through 2 versions as I moved from Windows XP to Windows 7 64-bit but it's worked perfectly every day. The local backup is on a separate internal hard drive. The remote backup is in a TrueCrypt container on a 1TB USB 3.0 drive that I keep outside the house. I also keep system images on that drive. I'd been lusting after Carbonite and even recommended it to my daughter and her husband. He became a big fan with hundreds of gigabytes. But I had been limited by the upload speeds of my DSL connection. Well, DSL is no longer part of my life! So I revisited Carbonite. In my research I came across several competitors: Backblaze, CrashPlan, SpiderOak, etc. CrashPlan stood out to me as it allows you to provide your own offsite backup at no cost and without the long initial upload phase. And it's TNO (Trust No One). Their instructions are here. I did that. It works perfectly. I seeded my backup folder onto a 500GB USB drive. 200+ GB took just over 6 hours. Then I took it to my mother's. I plugged it into a backpanel USB port so she wouldn't see it and unplug it! 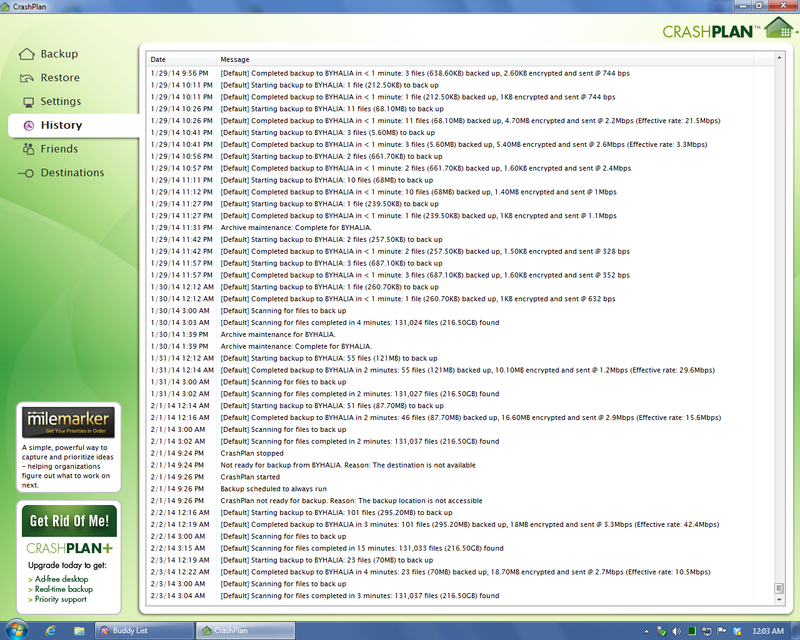 Here're screenshots of my CrashPlan configuration and history log. On the "Restore" screen you can see that the file XMASNAMES2013.doc has several versions in the backup set. The line near the bottom has clickable links where you can specify which version to restore, where to restore to, and whether to overwrite or not. On the "Settings / Security" screen you can specify your own encryption key. On the "History" screen you can see that it is backing up every 15 minutes during the trial period. You can see an interesting impact on my bandwidth. On 01/01/14 I began downloading 2 Windows 7 ISO files. They didn't complete until early morning on 01/02/14. Each was about 3GB. Not thinking I put them on my desktop which is included in my CrashPlan backup set. Subsequently CrashPlan uploaded those ISO files to my offsite system. 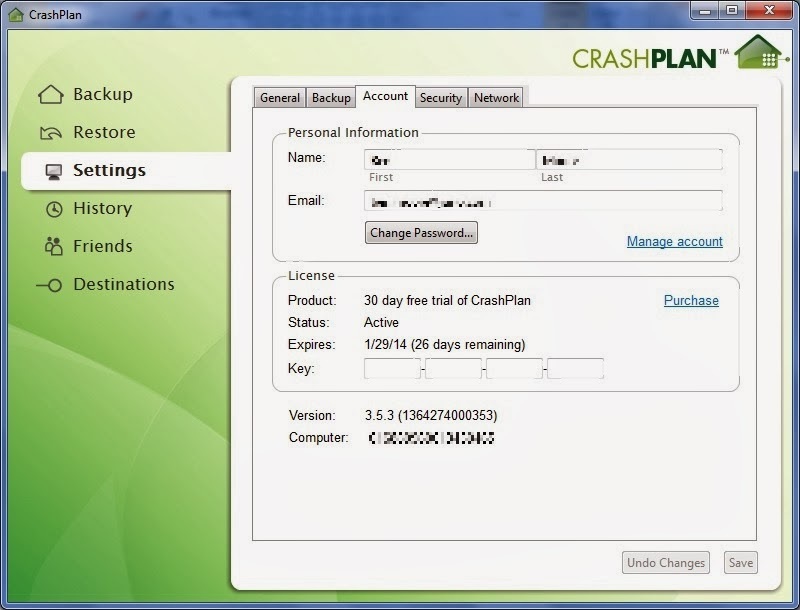 CrashPlan worked great for a couple of days and then started complaining that it couldn't reach the remote system. I hadn't changed anything. After several fruitless exchanges with CrashPlan support I turned to Google and found this thread on DSLReports.com. I began a dialog with one of the participants and he showed me what I needed to do. All that was necessary was to open port 4242 on each of the routers and forward them to the appropriate system. 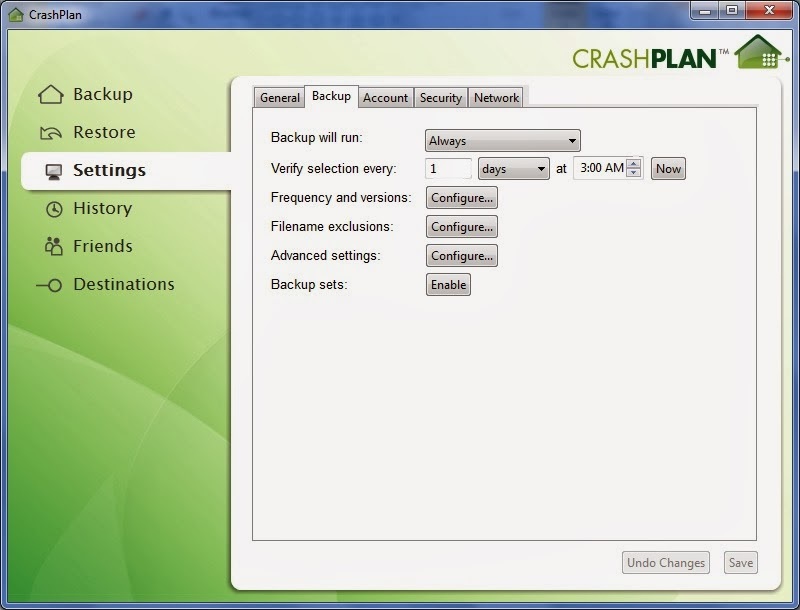 A day or so after doing that and rebooting both systems CrashPlan was back working fine. Longer term I'm going to move the port 4242 activity to another less well known port. 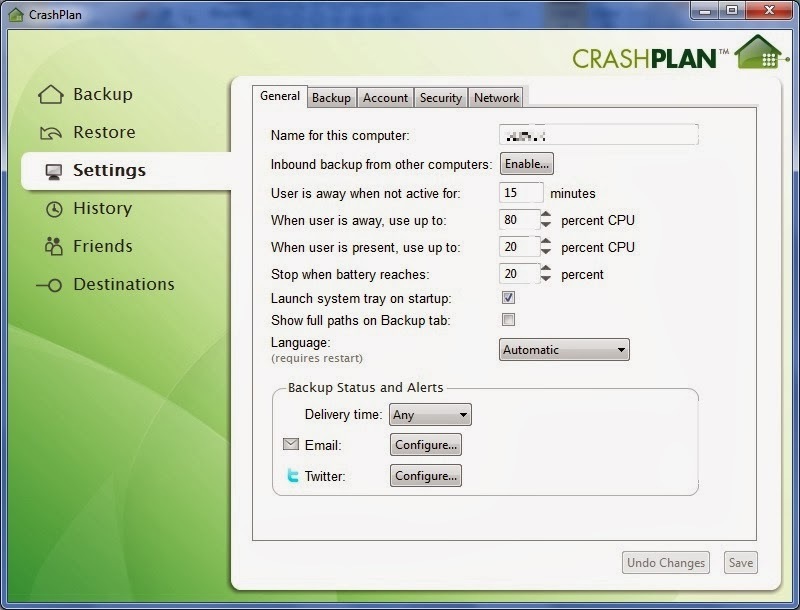 There's a setting in CrashPlan to do that. Here are a couple of days of logs from both ends. I don't have CrashPlan's bandwidth throttled (which is possible) but the BYHALIA system's bandwidth is only 3Mbps. 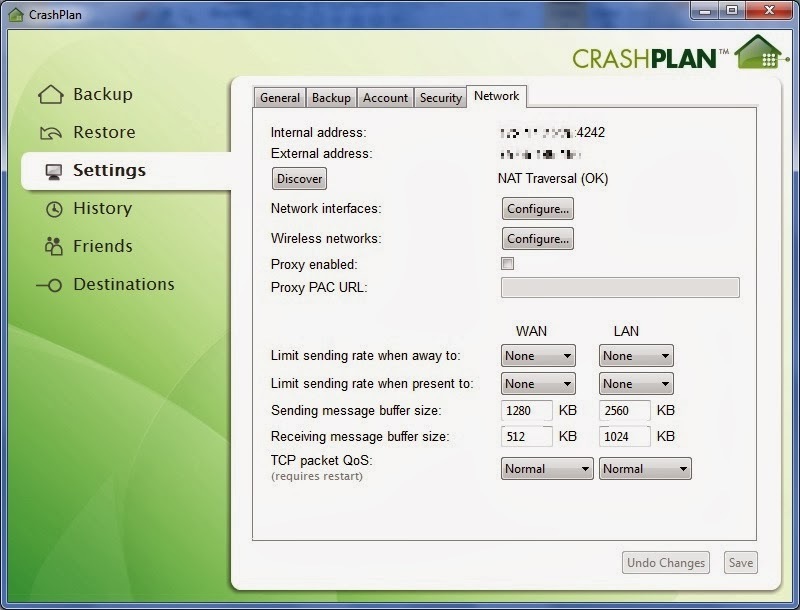 It's also interesting to observe how CrashPlan minimizes the data transferred. On 01/30/14 at 12:12 AM it needed to backup 1 file of 260.70KB yet the data transferred was only 1KB. This is probably too much of a reduction for compression so CrashPlan must either be doing deduplication or block level backups. 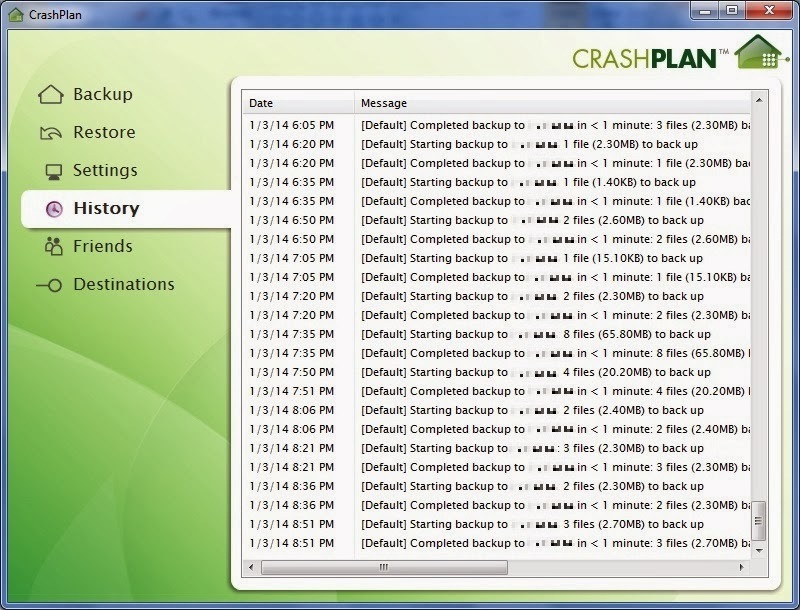 From these logs it is apparent that CrashPlan only backs up once a day to remote folders. The early more frequent backup is when I finally got the port open between the two systems. Tivoli is running fine so I see no need to abandon it. 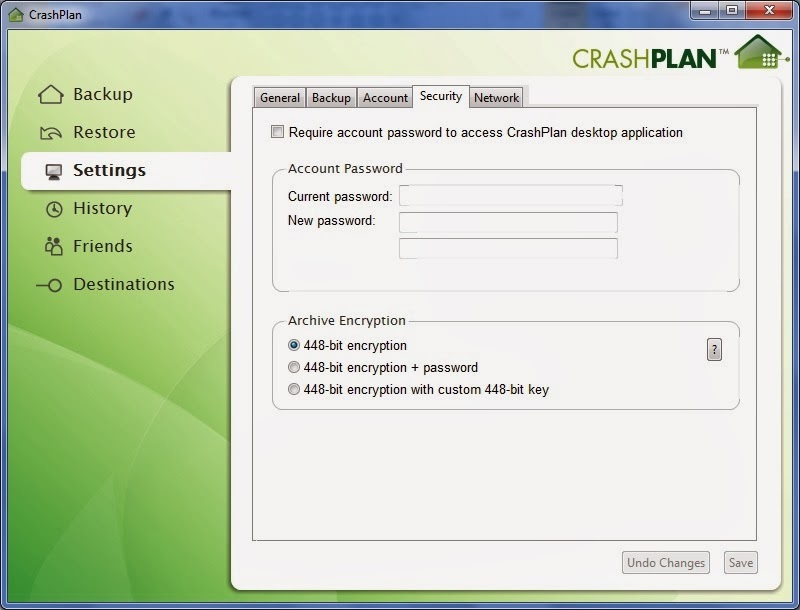 I may look at using CrashPlan's cloud offering to make some of my data available on my mobile devices. Scenario 1: The USB hard drive at my mother's crashes. I buy another USB drive and re-seed my backup folder. Then I take the new USB drive to my mother's and attach it. Scenario 2: The computer at my house disappears. 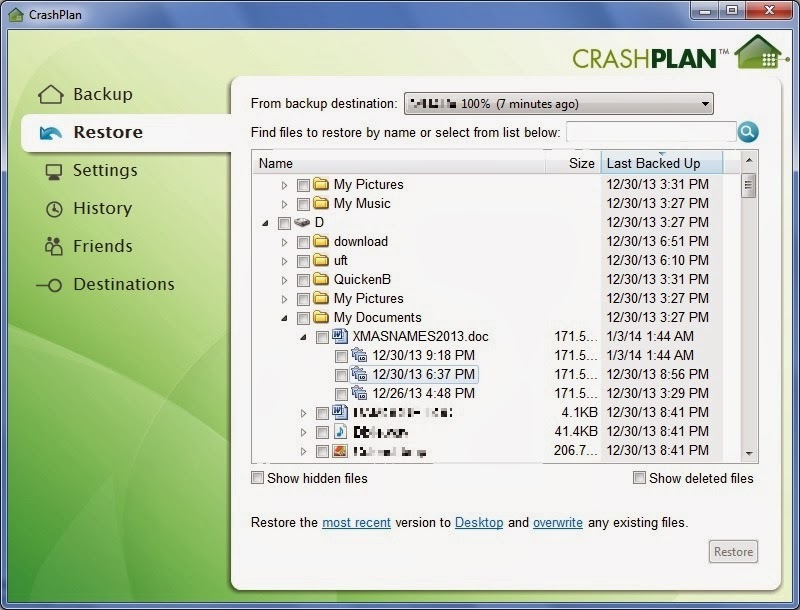 I acquire a new PC and restore my system image backup (not from CrashPlan). Then I go to my mother's and get the USB drive and take it home. I attach that drive and the associated CrashPlan folder to my new PC and restore everything. This is all in addition to my Tivoli backups.